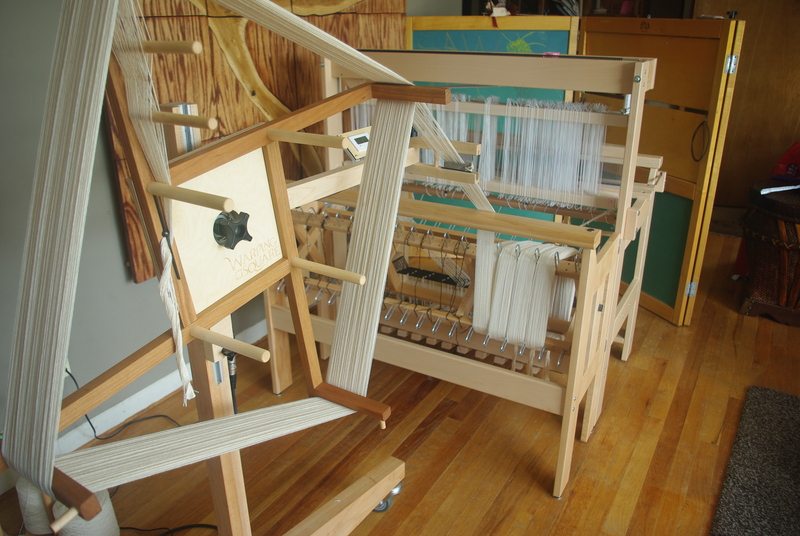 Other than a loom itself, the single most important piece of equipment I own is my Sawyer Bee Warping Square. I got mine three years ago and wouldn’t be without it now! I use it for sectional warping and I find it makes warping dramatically more efficient and quick. I talked about how much I love sectional warping and some ways to approach it here. More information about this fabulous piece of equipment below. We’re waiting for these to arrive and will announce on Instagram and Facebook when they do! The Sawyer Bee Warping Square is a hand made, high quality piece of equipment designed to make sectional warping fast, consistent, and efficient. 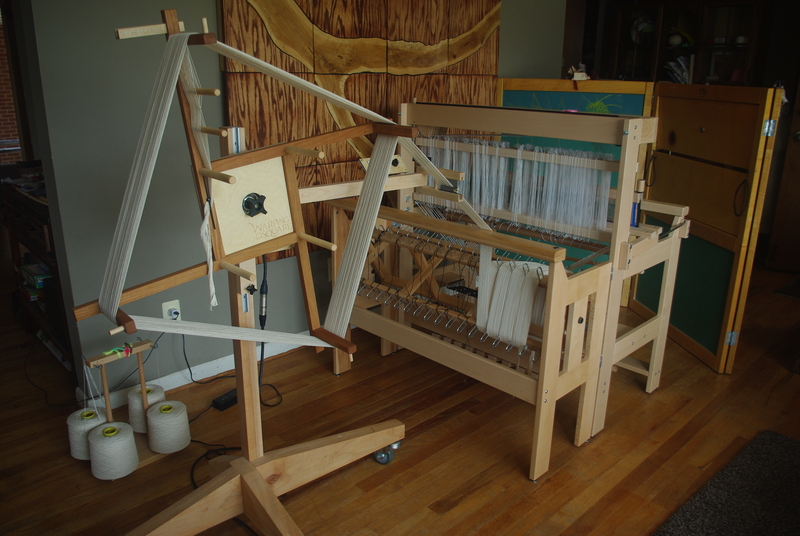 I have had mine for three years and aside from the loom itself, it is the single most important piece of equipment in my studio. I switched to sectional warping to make warping fast and modular – I could do it piece by piece. Very important in my busy life! I also switched to be able to warp as long as I pleased, without dividers packed into the warp, and to have much stronger control over warp tension. I talked more about sectional warping here and it might be a helpful read! The Sawyer Bee Warping Square allows you to make the section/chain on the Square quickly and with minimal effort, with thread by thread control. The section is then unwound and beamed directly onto the loom. It allows you to fully warp one section at a time, without leaving the warp vulnerable. It also helps have excellent tension across the loom. For me as a weaver, it was an absolute game changer. To make a section, put the cones on the ground below the intake of the Square, feed the end(s) through the mini-reed, and wind it on, securing the end in the clip and passing it through the mini-reed at the top to secure/set the sett, which will create the right size and density of section. You do this over and over until you’ve made your section. At that point you cut the ends, tie a knot, secure that to the leader cord for the section on your loom and beam. The Warping Square can take warp lengths from 2.75m to almost 50m, so it is extremely versatile. This can also be used as a skein winder! It’s easy to wind skeins by hand with the Square, or with the motorised version it’s even faster! The only consideration is that the skein sized is fixed at 2.3m circumference; to me, this is absolutely fine and worth it to be able to power-wind and be a double purpose tool, but do bear it in mind. The other use is to make chains quickly and efficiency (and more ergonomically, in my experience) than on a board. The sections can then be chained off and stored, or painted, or even used together to plain beam. To then warp the chains you can either feed them through a tension box onto the loom, or even wind them back onto the Square to then be warped as usual. The Saywer Bee Warping Square makes sectional warping fast and efficient, while maintaining excellent tension. Handmade, high quality: this is a solid piece of equipment made with skill and love. Every aspect has been made with great attention, from the wood to the finishing. The Square spins on bearings and has a cog & pawl system allowing it to spin freely in the wind-on direction, but engage the adjustable friction tensioner in the wind-off direction. Reduced preparation time: unilke a spool rack, there is no need to prepare bobbins or spools; you warp directly from your cones. Also no time consuming standing at a warping board making a section. Reduced yarn waste: everything you wind is used for the warp, and you only warp what you need. The calculated path of the yarn also includes the distance to the locking clip, so nothing is wasted apart from trimming the warp before tying on. You warp directly from your cones. Even tension: the Warping Square has built in resistance so it will stay consistent. This saves time and yarn and stress. Thread by thread control: as you make each section you can warp thread by thread, giving total colour control. This makes it useful for working with pinstriping from dyed or stock colour yarns, or for making tartans or other designs with precise threading orders. Built in cross-maker: if you want to use a cross to preserve colour order, a cross maker is built into the Warping Square. And if you don’t want to use it, you don’t have to. Totally up to you. Quickly create solid colour warps: if you’re creating undyed chains (e.g. for handpainting, or just for working natural) you can quickly create your chain. Movable: the base has locking caster wheels so that you can move it about your studio, pull it out when needed then put it back in the corner, and lock the wheels so they don’t move while you’re working with it. Two versions: motorised and manual. I recommend the motorised version particularly for people who may want to do longer warps and use this as a skein winder. Overall I love to have the versatility of a motorised warp but for standard beaming non-motorised will be suitable, doing the rotations by hand. This needs clearance behind the loom in order to spin freely and have a clear path from the Square to the warping beam. You will need a sectional beam in order to use this for sectional warping. We sell sectional expansion kits for Louet beams. Please contact us for more information. It is possible to use the Warping Square without a tension box, however I like to use that as well just to keep things organised and under tension. We sell Louet tension boxes. Please contact us for more information.